A sandstorm has downed an Iraqi military helicopter, killing its five-member crew, while a Baghdad blast has killed five Iraqis, officials say. The helicopter was providing aerial protection to Shia pilgrims travelling to the city of Karbala when it crashed in the sandstorm early in the morning. Although sectarian violence has fallen, Shia pilgrims are often targeted. The bomb in Baghdad was planted on a road in the predominantly Shia Sadr City neighbourhood. The crash of the surveillance helicopter just west of Karbala, 50 miles (80km) south-west of Baghdad, was being investigated, officials said. The Sadr City bomb killed at least five Iraqis and wounded 12 others as they waited to collect their pensions, police said. The level of violence in Iraq has decreased since 2006 and 2007, when Sunnis and Shias fought a bloody sectarian conflict, but Shia pilgrims are still targets for Sunni insurgents, correspondents say. 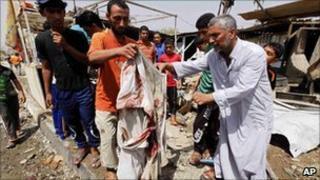 On Monday, two car bombs exploded near Karbala, killing at least 20 mainly Shia pilgrims and wounding more than 50. On Tuesday, six people were killed and dozens wounded when a female bomber blew herself up near a checkpoint in Karbala.